Deposit of $500 / €440 will reserve your place. ArtisTTable: Artists International – Art Retreats & Workshops take a journey into the Heart of the old city of Granada. We invite you to join us on an unforgettable adventure into the magical Spanish city of Granada, from 15 to 22 September 2019. Located in the western foothills of the Sierra Nevada mountain range, in the region of southern Spain known as Andalusia. Granada is historically has been a city rich in cultural diversity where Islamic, Christian and Jewish traditions have lived side by side for centuries. This diversity has given way to a charming and beautiful aesthetic that has permeated the city’s architecture, pavement and culinary offerings. From scenic hilltops to narrow cobbled streets that are all in the shadow of the imposing structure of the Alhambra, Granada has been an inspirational setting and backdrop for the artists, Salvador Dali, Luis Buñel, Fredrico Garcia Lorca and their collaborations. You also cannot think about this place without considering the passion of flamenco either. We will be drawing, painting and experiencing all of the excitement that is Granada. This retreat is going to be as amazing as it will be unique! Things we will see, do and paint. Everyday we will concentrate on different aspects of what this wonderful city can teach us as artists. Just the way that the city is situated on the hillside, its walls, rooftops, narrow lanes will present us with more than enough material and subject matter to get us thinking in new ways about perspective, proportions, light & shadow, panoramic views, and design motifs that are so unique to Granada. A Drawing Safari is an invaluable exercise and it is an ArtisTTable original. On this Drawing Safari we walk carefully through the old streets of Granada and find beauty in the unexpected. When you are there you won’t be surprised that we will find so much inspiration in this place. On our Drawing Safaris you will learn to look fast and draw fast, this will not only hone your drawing skills, but your powers of observation will be sharpened. It also is a great way to get to know and love your surroundings. Royce and Tali on a Drawing Safari in Granada in 2018. We welcome artists of all levels of drawing and painting experience. Because of the often wide breadth of experience we adapt our guidance and instruction to the individual. It is our great honor and pleasure to work with the variety of artists that we have on our retreats and we make ourselves available in any way that you might need us. We present painting demonstrations as a method of explaining artistic concepts and techniques. Tali presenting an oil pastel demonstration. There is always something exciting happening in Granada day or night. In the evenings we will have the opportunity to go see a few different flamenco performances where we will be able to take our sketchbooks and see what we can come up with. Some of our favorites are, Chien d’ Andalusia, Jardines de Zoraya, and Peña la Plateria where we can have a great dinner on Thursday night. Flamenco in Granada es muy bien! Olé! Built from about 1238 to 1391AD, the Alhambra is the last and finest Muslim monument in Spain. We will visit the amazing wonder of man. The moorish motifs that adorn just about every surface of the palace will fill you to overflowing with colors and design ideas. The gardens are beautifully manicured and filled with exotic plants and flowers that are sure to inspire us. Our visit there will be a grand opportunity to see first hand how deep integrated the designs and this culture are. It is important because as artists we are indeed that link that create all of those crucial connections. You can’t really go anywhere in Spain without coming face to face with some tapas. Tapas is derived from the Spanish verb tapar, meaning to cover. As the story goes, the early tapas were served on flat pieces of bread in taverns to sherry drinkers who would place the bread over their glass in between sips to keep fruit flies out of the glass. Now they have taken a whole new and fascinating direction. Now they are often considered an appetizer that are often just brought to you when you order a drink in a cafe. But there are restaurants that serve a wide variety of tapas that you may combine to make a full meal. Our favorite place in Granada that we will take you is wonderful and is all you can eat for €10. The materials you bring on this retreat are up to you. But as we are moving around a lot during this week on foot and working sometimes in narrow passage, large scale paintings or oils are not advisable. 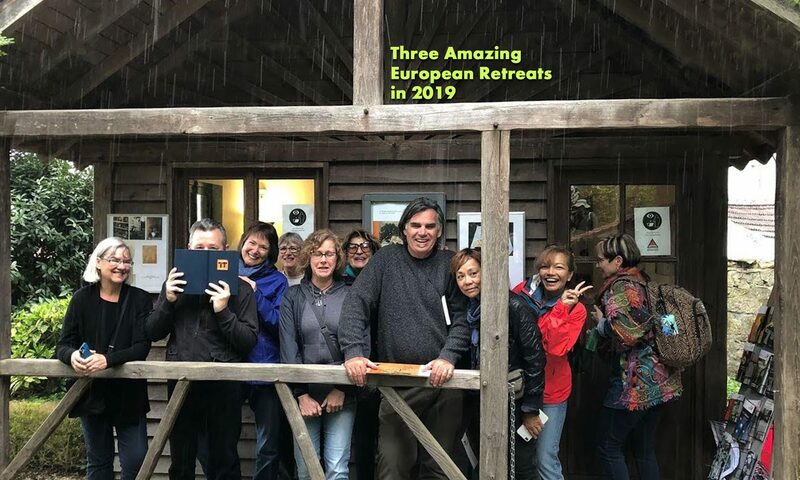 In keeping with the energetic nature of the city, this retreat will be much more about recording quickly the movement and action of the experience. While we will be able to paint, in general the locations and how we will be moving around will probably lend itself much more to smaller lighter weight painting kits such as watercolors, rather than heavier oil or acrylic set ups. Working gesturally will help us to both loosen up and sharpen our ability to look fast and begin to understand what we see. By creating many smaller works you will collect a lot of information that you will be able to take back to your studio and create bigger more involved paintings. We are confident that once Granada gets under your skin you will be fully inspired to make many paintings. We will be staying in Hotel Sacromonte, right in the heart of the city of Granada. Travel to the retreat from outside of Spain is best accomplished by flying to Madrid or Malaga. From Madrid you will need to take a train to Malaga. Whether you take a train or fly to Malaga, you will take bus to Granada. There are also rental cars available in Madrid. From within Europe or Spain itself driving to Granada is a possibility. Of course train travel is always available, but you need to be aware that you will need to transfer in Malaga to a bus to get to Granada. We are always looking for new places that will spark creativity in new ways and this Heart of Granada art retreat will be that. We will help you nurture your powers of observation and your artistic practice so that it will grow and grow. During our time in Granada, aside from working on capturing the essence of this city and its culture and the gesture and flavor of flamenco, we will spend a lot of time working on the principles of composition, balance, color, texture and mark making exist there. We want your experience to be rich and full of many painting adventures. For more information on this trip to Granada, please contact us.